Will just add what J.D. and I always tell folks when visiting the first shot marker at Gettysburg. Be careful out there as that section of Route 30 is very busy. Best bet is to park on Knoxlyn Road and walk across the street to see the marker. It really is a great site, and you can see the bullet holes on the house there as well. Thankfully, the Friends of Gettysburg were able to purchase the Wisler home (where the marker rests) and now the NPS has it. At this point, visitors are able to pull into a gravel driveway next to the house, but it’s still dangerous and you must exercise caution. Rt 30 is posted 35mph I think, but folks fly on that road over 50 and you must be very, very careful when visiting the location. Great ARTICLE!!! I just showed this to Bev and she says, Hey I have been out there! Its gotten to be one of my favorite “forgotten spots” that I love to take people to! It still doesnt get the visits like other parts! And at least I know that part of my dues went to good deed! I’m so glad that the Wisler home and property were saved for the NPS, and that generations will be able to enjoy it and hear the story of where it all began. I was wondering if Capt. Jones ever had any children with his second wife. I am a descendent of a Captain Jones, Great granddaughter of Fred & Louise Jones. Louise possessed his Civil War Saber until it was passed on to her son, Harold Jones and I know that Capt. 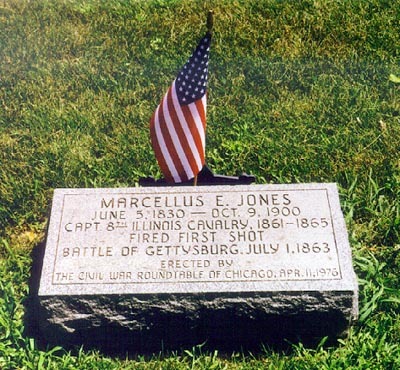 Jones was from Illinois. Just wondering if I might have the right Capt. Jones. I know there is more than one. Well what great writing, very impressed. I was looking for my gggrandmother Nancy Jones b. circa 1802 in Virginia. She died in Coles County, Oakland, Ill. 1865. These dates have not been confirmed by me yet, but she was found in the 1850 census with James D. Hunt and children. I like to confirm until I am satisfied but losing steam for this one. Sarah Hunt married twice but my ggggrandfather was Nicholas Curtis. I think of Scottish descent. You might have a look at a Mormon Damily History Library. They have the most extensive genealogy data. Much of it on line and you can order microfilms from their main library in Salt Lake. I found things on my own family I didn’t know exist. One reason their data is so complete is that it is a Mormon requirement that all members trace their ancestry back at least 5 generations. Don’t worry, they won’t try to convert you. They are very helpful. And I am not a Mormon. With any luck, you will tie into a family tree already done and be able to trace your ancestry back many generations. I made it back to the year 430. No royalty either. The town has gone through many, many changes over the years and I’m proud to have been a part of some of those changes. I hope some of you would like to visit Glen Ellyn and tour Wheaton and Naperville as well. I am the great grandson of Nelson Whisler who served in Company C of the 8th Illinois Cavalry. He was incorrectly listed as John Whistler however. My great grandfather missed out on the Gettysburg battle as he was recovering from wounds suffered in a previous battle. However he engaged in every other battle during the war. Great site. I have the book on the 8th Illinois Cavalry written by the unit surgeon. My great grandfather was wounded 11 times. He died in 1928 at the age of 89. After the war he was owner and captain of a river boat on the Mississippi and other rivers. No not one of those big white gambling boats. His riverboat was smaller and mainly hauled logs, but also other cargoes. The book on the 8th Illinois Cavalry written by the unit surgeon is by a Colonel Hard. If you look around good you should be able to obtain a copy. I don’t have the book handy so cannot provide the publisher. Good site, and good reading. I would have to correct one thing, just because I’m unsure. I think the monunment is made of limestone, not granite. It has some considerable wear to it, and appears to me to be made of limestone — I would confirm that it was from the Naperville Quarry. * I went to the site with NPS permission and took a casting of the monument. My grandfather, Morgan Hughes, was a bugler for the 8th, Company E. His bugle sounded the first notes of the battle. We passed it along through the generations and it is now in the new Gettysburg Museum. * Levi Shaffer, the Sergeant who was issued the carbine that fired the first shot (by Marcellus E. Jones) returned to Naperville, and became a master carpenter. He built the staircase at the Martin Mitchell home in Naperville, which is now part of Naper Settlement.